First things first: this is surprisingly delicious. Surprisingly for my children, anyway, whose initial reaction was: “What on earth is that? Beans with clams? What possessed you to do such a thing?”. Within seconds, they had fallen silent, apart from the sound of soup being greedily slurped up. I rest my case; try it. This is not specifically a Sicilian dish, but both legumes and clams are harvested/caught here, so I’m appropriating it. It is in fact more likely to be found in other regions of Italy, and in a variety of incarnations – with mussels instead of clams, cannellini beans instead of borlotti, or using fresh or tinned beans instead of dried ones. The basic idea is however the same – molluscs cooked with legumes and tomatoes. Some recipes will tell you to put the tomatoes in the stock with the beans, but I would advise against this, since the acid in the tomatoes can significantly slow down the cooking time of the legumes, which take long enough as it is. This is why I only add the tomatoes when the beans are already cooked. On the subject of beans, a trick I picked up from Lynda Brown’s invaluable The Modern Cook’s Handbook is well worth remembering here, since it cuts soaking time drastically. Rather than having to remember to soak your beans overnight, simply put them in a pan with plenty of cold water, bring to the boil and then boil them for three minutes. Then take off the heat and put the lid on the pan. After an hour they are just the same as if they had been soaked all day. The cooking pot to go for is one of those glazed rustic terracotta casserole dishes with a lid. Cooked in this in the oven, the beans become beautifully soft without losing their shape (homemade baked beans, whilst we’re on the subject, are unbelievably good). You may notice that there is no salt in the recipe. This is not an oversight, but intentional. Perhaps what makes this dish so unique, and so tasty, is the way the clam liquor flavours the soup, providing a fresh, natural, seaside saltiness. Yes, I realize that might sound offputting, but trust me here; the saltiness is subtle yet unmistakably marine. It’s like eating fish and chips sitting on the harbour wall. I drank some fruity Sicilian Grillo with this, and it got on with the soup like they were long lost friends. With the combination of aromatic tomatoes, creamy beans and mineral, saline clams, something too crisp and dry just wouldn’t work. You want something accommodating, not too edgy. Wash the clams well, discarding any that are open and have no intention of closing up again when prodded. Place them in a bowl with water in which you have dissolved 1 tablespoon of salt, or even better in a bowl of seawater. Leave them there for at least an hour to expel any sand or grit. Meanwhile, in a terracotta casserole dish (one with a lid, which you will need in a minute) placed over a lowish heat, gently sweat the onions in the oil with the garlic, half of the parsley and the rosemary, if using. After a few minutes, add the wine, bring to the boil, reduce slightly and then add the stock and beans and stir well. Put the lid on and place in the oven. Take out after 45 minutes to stir. Put the lid back on and put back in the oven for a further 45 minutes. Drain and rinse the clams. Take the casserole dish out of the oven and check that the beans are cooked. Mix in the tomatoes and clams. Back in the oven again with the lid on for a final 30 minutes or so, after which time the clams should all have opened up. If not, give the soup a few minutes over a medium heat on the hob, with the lid on. Sprinkle over the remaining parsley, some freshly ground black pepper and chilli flakes if you like, and serve. 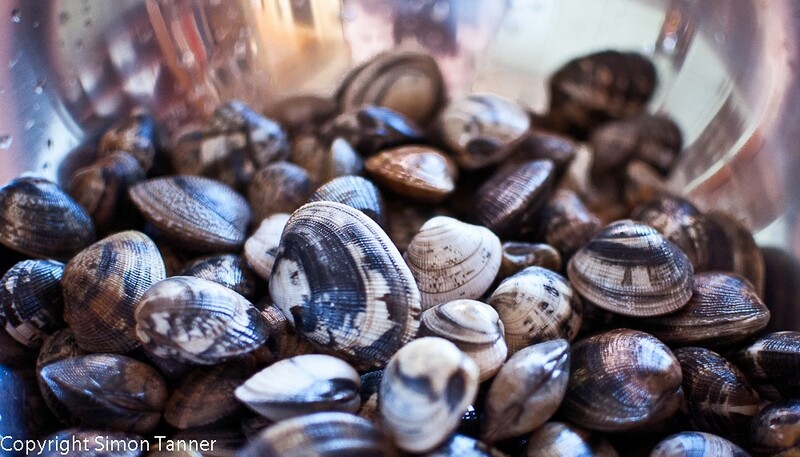 Don’t forget to put a large plate in the middle of the table where everyone can dump their empty clam shells. 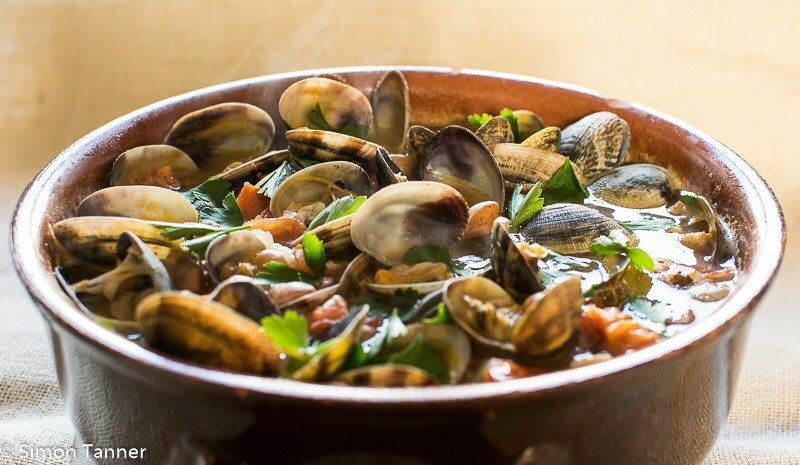 This entry was posted in Fish, Recipes, Soups and tagged beans, clams, fagioli, fish, legumes, seafood, soup, vongole, zuppa, zuppa di vongole by hungryenglishman. Bookmark the permalink. Very good. Particularly if you leave out the clams.